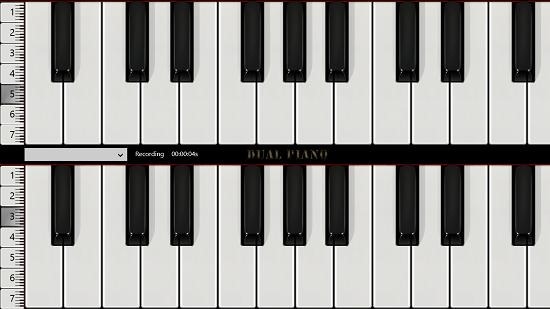 Dual Piano is a free professional dual piano app for Windows 8 and 8.1 which fully supports multi point touch upto 10 fingers on supported touch devices. The app is fully fun on non touch devices as well. The app allows you to play songs, change the octaves of the piano, play pre recorded demo songs and what not! The app is very lightweight at under 50 Mb and makes for a truly great download on any device running Windows 8 or 8.1. The interface is flawless as well. 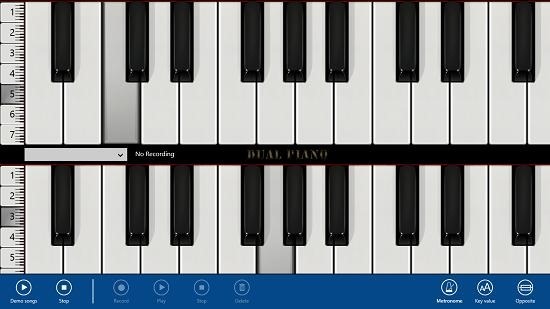 Dual Piano is available for free from the Windows App Store and works offline as well. When you run the app, right off the bat you will be presented with the piano interface which is shown in the screenshot below. You can change the octaves of the piano by clicking on the octave numbers at the left side of the screen and the key layout will change accordingly. 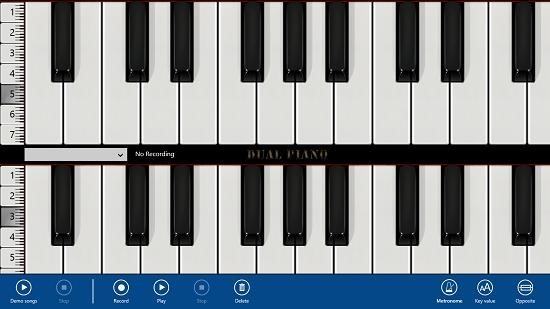 The keys are big enough to give you a feel of playing the real thing when you actually start playing the piano in this app. You can see the screenshot below which shows a key pressed. Believe me when I say that the key press sounds in the app are truly amazing and sound like a real piano being played if you are plugged into a speaker set. You can also toggle the action bar by swiping from the bottom on touch devices or right clicking on non touch devices. You can choose to play back demo songs from the demo songs button at the bottom left of the screen. Clicking on this will present you with three demo songs which you can click on to watch them being played on the piano in real time. You can see a preview of this playback in the screenshot below. You can stop playback of the demo song by clicking on the Stop button next to the Demo songs button. You can also record your own song by clicking on the record button. A recording in process will show the recording timer at the center split of the two pianos. 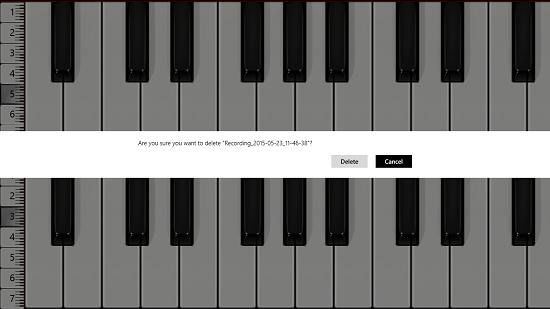 You can then choose to either play back this recording which will show the keys being pressed as you pressed them and the sound being played back as well, and you can also choose to delete this recording by clicking on the delete button in the action bar which will present you with a popup as shown below asking you to confirm whether you really want to delete the recording. Choose the appropriate option in the above popup according to your liking of if you want to delete the recording or not. This briefly winds up the main features of Dual Piano. Dual Piano is a well designed piano app for Windows 8/8.1 with multi ouch support. The app may be freely downloaded from the link below.